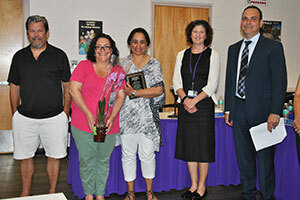 At the presentation of this year’s “Jodi Denmead Outstanding Parent Volunteer Award,” from left: Don Denmead; MS PTA President, Kim McGowan; recipient of this year’s award, Sandy Singh; WVCSD BOE President, Lynn Lillian; and WVCSD Superintendent, Dr. David Leach. Since 2008-09, the Warwick Valley Central School District has presented the Jodi Denmead Outstanding Parent Volunteer Award to deserving volunteers, in honor and memory of Jodi Denmead, who was a very active parent volunteer in our school PTAs. This year’s recipient is Warwick Valley Middle School PTA Vice President, Sandy Singh. In presenting Sandy with this year’s award, current Middle School PTA President, Kim McGowan, expressed appreciation for Sandy’s many years of volunteerism and dedication to our district and students. Said Kim, “Sandy is a tireless volunteer who has selflessly given her time and energy to the children of our district, chairing Book Fairs and Basket Auctions, yearbooks and dances. She even literally ran a circus at Sanfordville Elementary School.